Make this quick recipe in place of a can of Cream of Chicken Soup the next time you need it for a healthier alternative to condensed soup. Have you ever stopped to read the ingredients list in a few of your pantry staples? I try to cook with only foods that have ingredients that I could use in my kitchen. Yes, that means some foods don’t last as long without all of the preservatives, but they also taste better and are generally healthier. 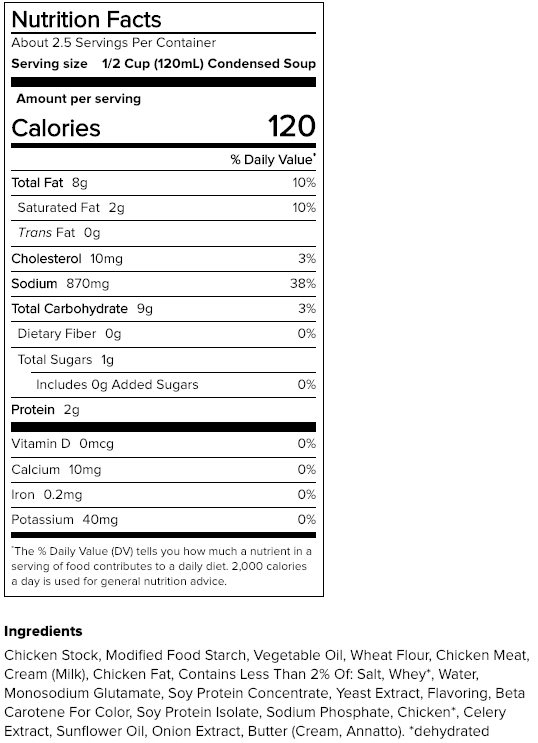 For example, look at the nutrition and ingredients for a can of Cream of Chicken Soup. The ingredients aren’t horrible, but look at the amount of sodium in one serving. If you use the entire can, it would be about 2,175mg of sodium! And that’s before you add any other ingredients to your meal. Because let’s be honest here, no one eats this as a soup. At least, I’ve never heard of it. Cream of Chicken is usually an ingredient in a recipe. There are a few recipes I have that call for cream of chicken soup. So, instead of writing those recipes off as goners, I decided to do some research (aka hit Google and Pinterest) to find some recipes. I came across this one and decided it was worth a try. The ingredients are all ones that we always have, and it didn’t take long. I needed two cans worth of soup for my recipe, so I doubled the amount. After it’s been cooked and cooled, you can transfer it to an airtight jar to keep in the refrigerator for a day or two. I made mine the night before I needed it, then used it the following day. It will thicken a lot in the refrigerator, so if you need it soup consistency you’ll want to make it right before using it. I knew mine was going in the slow cooker, so it would have time to warm up in there. Whisk in the flour and stir continuously for about 1-2 minutes. Add the chicken broth and milk, whisking until it’s well combined and there are no lumps. Add the garlic powder and pepper, then stir to combine. Bring to a simmer and continue cooking and stirring until the mixture thickens (about 2-3 minutes). Remove the soup from the heat and use in place of a can of Cream of Chicken soup. Or, refrigerate once cooled to use within 2 days. Cream of chicken soup is one of my favourite flavours! This recipe looks nice and simple and not too many ingredients either so I might give it a try! It looks delicious! It was just the right flavor to add to recipes without all the extra crap that the canned stuff has. Looks like a good recipe for a cold night. Definitely something a lot of people need in the Midwest right now. Luckily we warmed up again today, but it’s supposed to get cold again. I do notice that almost every recipe that needs the soup as an ingredient is a warm recipe and this tastes so much better than the canned soup. Sounds so good! I love a god soup recipe for the winter months! I’ve always known that canned foods tend to have a high sodium content but I never expected it to be that outrageous! Thank you for giving us a healthier, easy-to-make alternative! It’s crazy! I’ve been looking at both the nutrition facts and ingredients which is why I’ve also been trying to come up with tastier and healthier alternatives. That’s a lot of sodium for that little can. Just looking at the seasoning in your recipe, I’m sure it’s filled with lot of yummy flavor! And if you look at the serving size and servings per can, that isn’t even for the entire can! I am not a fan of campbells soup because they just taste like salt to me so doing my own would be awesome! And then I could enjoy it again! I never realized just how little flavor is really in something like this until I started making my own to compare. You should try this, it’s really easy and doesn’t take long at all. Wow! The salt amount is ridiculous! I had no idea cream of chicken soup was so easy to make and actually just needs a couple of ingredients! The salt is what made me start looking for an alternative! What a clever idea! I never would have thought of trying to DIY this, since I so rarely make things using condensed soup – what a great idea, though, for those rare occasions when I do! I don’t use them too often either and stopped making recipes that called for it because of the sodium and other crap in there. When I had a craving for a meal with the Cream of Chicken soup, I knew I needed to find a better alternative. I am currently trying to eliminate a lot of the processed foods we eat in our house, this is really a good idea. We try not to use them either. This was a great replacement for the canned soup! I love being able to make things from scratch rather than buying them canned. This is a great recipe to have! The taste is so much better and doesn’t have near as much sodium or other ingredients in it when you make it at home. It is great that you give us a home made alternative to canned products! This is so much healthier! thank you! So happy to help! There are so many unnecessary ingredients in the canned foods that we don’t need. I also am a big fan of using what I have. Overall, this recipe seems simple to make. You could just add a few vegetables in after making it to add a little variety or eat it as is! That would be interesting. I’ve never eaten this plain as a soup, but always use it as an ingredient in a meal.